Cannabis is increasingly being recognized for its therapeutic value, with many governments reducing its regulation. As cannabis production becomes legalized and regulated, manufacturers have a responsibility to evaluate the chemical content and potency of their plants. In addition to its established psychoactive effects - getting ‘stoned’ - THC is imbued with various other valuable effects. THC has been shown to increase appetite and to mitigate nausea, inflammation (redness and swelling), pain, and muscle spasms. In cannabis cultivation, the important factors indicating the value of the crops are the levels of THCA and CBDA, which are acidic forms of THC and CBD. The THCA and CBDA levels vary from 5% to 30% based on the species of the plant crop.5 The plant flowers contain most of the cannabinoids, including CBDA and THCA, and are then harvested. Cannabis plants are constantly being developed and selectively cross-bred to improve the yield of THCA and CBDA as well as to increase the variety of other cannabinoids found in the plant flowers. A convenient and rapid analytical technique is required to obtain quantitative data on the cannabinoid content of different strains. The difficulty of analysis lies in throughput and accuracy; there is such a volume of material that traditional gas chromatography is not feasible. Although the most accurate methods are gas chromatography coupled with mass spectrometry (GC-MS) or nuclear magnetic resonance (NMR), the equipment for either method is expensive and needs a skilled operator for a successful analysis. Alternatively, cannabis growers could deliver samples to a GC-MS analysis laboratory, but this approach is also expensive and can cause delay due to the time between acquiring the samples and obtaining the results. Spectroscopy is increasingly becoming a method of choice for growers because spectroscopic methods are 5 and 10 times faster than GC-MS and can be carried out by a relatively unskilled operator. FT-IR is rapidly becoming the technique of choice as it can deliver instant results. FT-IR can be employed to monitor the changes in plant potency over time, as the plant grows, and the effects of the external environment on THC and CBD production. Due to the presence of a wide variety of cannabinoids, FT-IR analysis of cannabis could be problematic because peaks resulting from THC could be masked by other compounds.7 However, it is easy to employ chemometric methods, which statistically separate overlapping peaks and enable the rapid and accurate, on-site determination of THCA and CBDA in cannabis flowers. GC-MS and NMR requires sample preparation, sampling, and a specialist analytical lab, causing delays and making these techniques more expensive. As FT-IR monitoring can be performed continuously during plant growth, it is possible to rapidly change the growing conditions to maximize the THC and CBD yield. 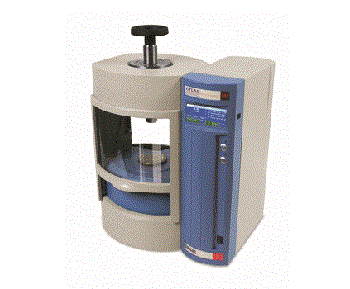 An Atlas autotouch press provided by Specac can be employed to compress cannabis samples into pellets for analysis. 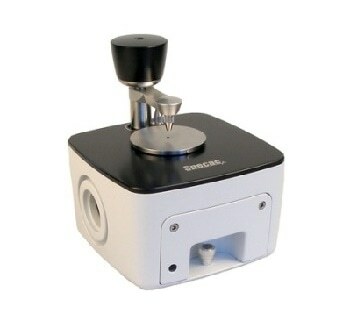 Although it is not essential for experiments using the QUEST, which can handle different sample sizes and shapes, it can be useful for further chemical analysis integrated with IR. The Quest and Atlas autotouch press from Specac for FT-IR analysis. With Specac’s ATR accessories such as Quest, continuous and consistent FT-IR analysis of cannabis can become a viable and inexpensive option for cannabis cultivators. Brian C. Smith, Fundamentals of Fourier Transform Infrared Spectroscopy, CRC Press, Boca Raton, 2011.